When How Sweet It Is posted this recipe, I knew immediately that I would be trying it. I mean really, with her willingness to interrupt our busy plans with this recipe, how could I refuse? :) The flavor combination was an instant win in my book - kind of an extra rich and sweet twist on a yummy frappucino I enjoy occasionally - ahem. This recipe was super quick, super decadent, and totally yum. I think we may have a new fudge recipe to add to our annual favorites - peanut butter, chocolate, and butter pecan. We may like fudge - the vote is still out - you can send me more recipes to, you know...make sure! Let me tell you a little secret about this recipe...I made it in the microwave. You can certainly use the double boiler as the recipe recommends but I noticed that she mentioned the microwave as an option and I was sold. You see, I was up to my eyeballs in cookie baking when I threw this recipe in to the mix between shuffling cookies into the oven. So, yes, it was easy. :) You can go here for her original awesome recipe. I'm going to post my microwave version in case you are lazy like me. Seriously, how pretty is this?! This would make aa really great gift! Oh and I forgot to mention - my mom thought this was wonderful. Line an 8×8 pan with buttered foil. Add semisweet chocolate to microwave safe bowl and microwave for 30 seconds. Stir and microwave for 30 more seconds. Add in half of the sweetened condensed milk (I eyeballed it), the coffee powder and 1/2 tablespoon (1 1/2 tsp.) of coconut oil. Return to microwave for 30 seconds. Remove and stir. Continue 30 second increments until fully melted and smooth. Stir in the vanilla. Spread evenly in the bottom of the pan. Mixture will be quitethick. Place in the freezer for 30 minutes (or less if your me and you want to hurry). Add white chocolate to a micorwave safe bowl and heat for 30 seconds. Add in remaining condensed milk and coconut oil and return to microwave for 30 seconds. Stir. Microwave 30 more seconds if needed until mixture is completely melted. Add coconut extract and thoroughly combine. 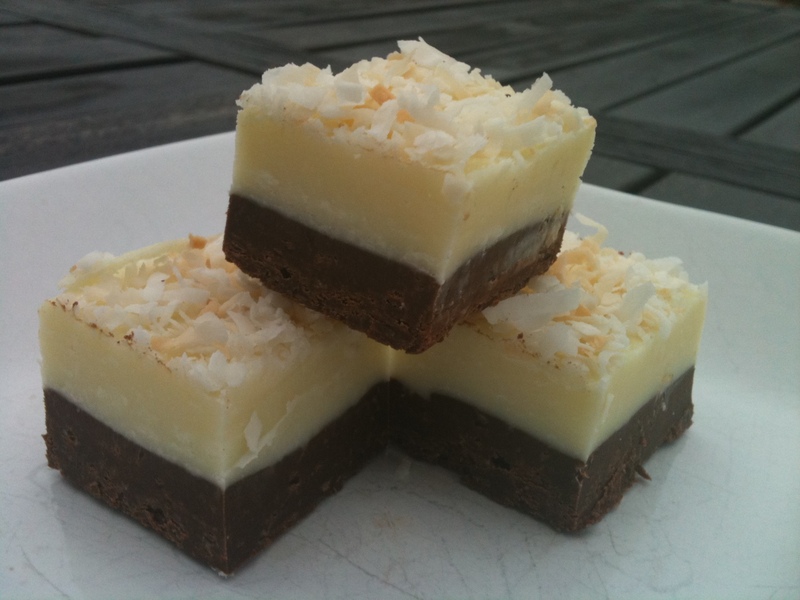 Remove fudge from freezer and add white chocolate on top, spreading evenly to coat. Top with toasted coconut, then chill in the refrigerator for 60-90 minutes. When ready to cut, fill a large cup with hot water or run knife under the tap. Dip a sharp knife into the water, then blot on a towel. Use knife to cut fudge into your desired size of squares. This is SO rich and SO good - I think you could easily cut this into 1 inch squares which would make for 64 pieces of fudge. :) Enjoy and go thank How Sweet It Is for this deliciousness and check out her site! If you like chocolate, coffee, and coconut, you will LOVE this. This looks divine and I think I might just make some this weekend!! I love fudge at this time of year! This recipe sounds amazing.